Light the Lakes 2019 – 50% of peaks have been bagged and another 50% left! Light the Lakes sees people from all over the UK migrate to The Lake District Cumbria and in the early hours of the morning, at a predetermined time between 0230 and 0300, light a blue flare or a beacon to remember fallen officers from the thin blue line. In aid of Care Of Police Survivors (COPS). With an amazing 107 peaks chosen to date thy’re looking forward to seeing many more peaks lit at the 2019 event in the Lake District. This year over 350 people took part, climbing 90 peaks, which is double the number in 2017. The event is growing steadily is becoming a permanent calendar entry for many people. “The event is open to everyone, and the great thing about it is that anyone can participate, whatever level you are at. We have the serious hill walkers who want to do the highest peaks, and we have family groups with young children doing the smaller fells.” said oganiser Vinny Wagjiani. “I find it hard to explain to people in words what it feels like to light a peak – a photo doesn’t really do it justice. You need to experience it yourself. “This year we also had strong support from Chief Constable Simon Cole, who is a trustee for COPS and is now continuing to help promote the event to reach my dream of covering 214 peaks. “We have already had 23 forces signup, it would be great to see all 43 forces including Scotland, Wales and Northern Ireland take part. • Light the Lakes 2019 is taking place on Friday June 21 – Sunday June 23. • The lighting of the peaks takes place between 2.30am and 3am on Saturday June 22. It is up to you when you climb your peak. Some choose to climb on the Friday evening and descend in the morning, spending the night at the top, while others choose to climb later on and come down in the dark following the beacon-lighting. • The event is based at Brathay Hall, Ambleside. On Saturday June 22nd in the afternoon, there is a food available and a get-together at the hall for participants. • Light the Lakes Welcome Packs will be available to buy and a link will be provided from December onwards? 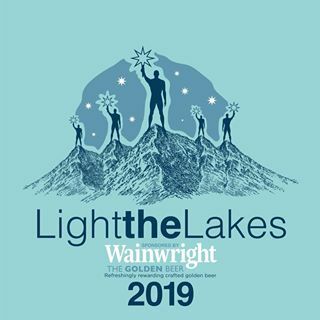 They will include a Light the Lakes T-Shirt, a flare for lighting your peak and a bottle of Wainwright’s Golden Ale, courtesy of the event sponsors, as well as a number of other goodies from supports. You can collect your prepaid Welcome Pack from Brathay Hall on the 21st. • Participants taking part in Light the Lakes are asked to raise money for COPS. Join the Light the Lakes fundraising team on Just Giving at: https://www.justgiving.com/campaign/lightthelakes2019 Sponsorship forms are also available.